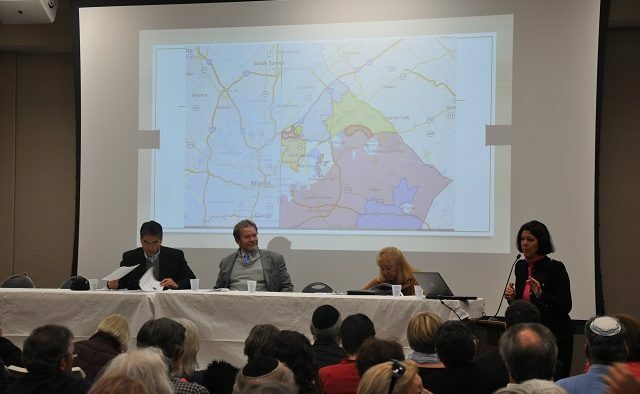 Together in Atlanta representatives sat in front of a crowded room at Young Israel on LaVista Road on Jan. 7 and defended a proposal to annex the Druid Hills neighborhood into Atlanta. The format proposed by the North Druid Hills Resident Association was to have TIA representatives and City Councilmember Alex Wan answer questions submitted on index cards. It wasn’t long before the conversation veered into the audience shouting questions – and a few accusations – at the panelists. 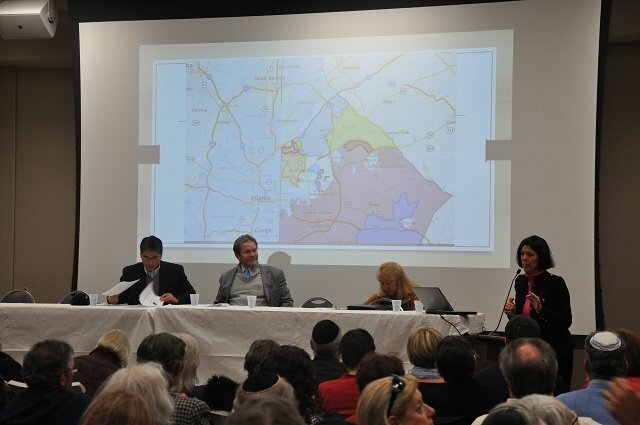 Together in Atlanta’s proposed annexation map reflects the attendance zones for Fernbank and Briar Vista elementary schools. But the main sticking point is that the proposal would also encompass Druid Hills High, which also serves Avondale, Laurel Ridge, and McLendon Elementary schools, as well as Druid Hills Middle. The annexation of Druid Hills High would mean DeKalb County Schools would have to redraw attendance zones for all of the schools that feed into that high school. The TIA proposal is part of a larger debate about annexation and cityhood in DeKalb County. There are also proposals for new cities being considered and existing cities, like Decatur and Avondale, are pushing their own annexation plans. Anne Wallace, representing Together in Atlanta, drew around of guffaws when she told the audience, “It’s not all about the schools.” She said it’s also about getting better services for the tax money residents in the affected area spend. The annexation would also encompass Emory University and the Centers for Disease Control. It may not be all about the schools, but schools were top of mind for most of the people in the room. Dave Moore, another TIA rep, put the proposal a different way. “The way the maps are drawn, the three elementary schools outside the attendance zones are not touched by this proposal,” Moore said, saying the intent was to draw the map in a way that would be least disruptive to students attending Briar Vista and Fernbank. There’s some important context here. All seven of the schools in the Druid Hills High cluster were previously part of a Charter Cluster proposal. That effort failed. The perception has been that the TIA proposal gives Druid Hills residents a better educational experience at the expense of the other schools in the cluster. Councilmember Wan, Atlanta’s point person on the annexation issue in Druid Hills, spent much of the evening using his matter-of-fact, neutral tone to douse some of the flaring tempers in the room. So where will kids in the other schools go if Druid Hills High moves to Atlanta? Wan said annexation would mean that the schools would become property of the city that annexes them. “The default position, unless the state legislature (dictates) otherwise, the default – and there are court case precedents that affirm this – is that the facilities go into the annexing municipality,” he said. That’s not going to happen without a fight. According to a recent WABE report, DeKalb County Schools is signaling it will battle the annexation proposal in court. The ramifications of annexing into Atlanta aren’t limited to the schools in the cluster that would remain in DeKalb County, however. The teachers and staff at Fernbank, Briar Vista and Druid Hills High wouldn’t automatically transfer to Atlanta Public Schools. They would remain employees of DeKalb County and would have to apply for jobs within APS, with no assurances they will return to the schools where they previously worked. In other words, it would be like hitting the reset button. “There’s no way that those teachers could remain DeKalb County teachers and teach at those schools,” Wan said. That idea wasn’t exactly closing the deal for critics sitting in the audience. Wallace said the staff would be making more money at APS, but that claim wasn’t debated at any length. So what would happen to any outstanding debt for the three schools? Does Atlanta assume that or is it left with DeKalb? Moore said in a follow up email that he is working on a concrete answer to that question. The Jan. 7 meeting is the opening act for a meeting tonight at Druid Hills High, hosted by the PTSA. The meeting begins at 6:30 pm and is almost sure to include a larger cross-section of parents who attend all schools in the cluster. It’ll be a hot one, as they say. Get there early. Wondering where your neighborhood falls in all this annexation and cityhood drama? Check out our handy map. Correction: An earlier version of this article misspelled the name of McLendon Elementary. The story has been updated with the correct spelling.